Anyone who's ever fancied a spot of computing in the garden but found that their PC's Wi-Fi antenna just can't hold the signal coming from indoors will jump at the chance to own Buffalo 's long-range wireless adapter. 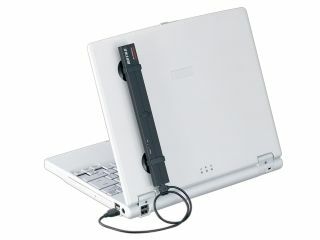 For JPY3,700 (£15.50) the appallingly named WLI-U2-SG54HP (let's just call it a Wi-Fi adapter) brings 802.11b/g capabilities to a laptop and can pick up a signal a massive 170m distant. That's at least twice the range of a normal adapter. All manner of encryption, including WEP and WPA-PSK, is supported, plus a 2m USB extension cable is available if you still can't get online and need to attach the dongle to the nearest tree branch. Buffalo reckons the device is ideal for multi-storey houses with a single Wi-Fi access point, but it's bound to see at least as much use in piggy-backing onto that faint signal leaking out of the office across the road. Buffalo - we, and the Fon movement for Wi-Fi sharing, salute you.